The British Armies Royal Logistic Corp operate a class of trucks called “Demountable Rack Offload & Pickup System” AKA DROPS. DROPS trucks are commercial lorry chassis’s that have a retractable hydraulic arm behind the cab. This extends across the rear and latches on to either a flatrack or container. The arm then retracts pulling either the flatrack or container on to the chassis and is then ready to go. The whole process is completed in a couple of minutes. The system offers a great number of advantages. Speed, safety and savings in operational costs. The vehicle is able to rock up to a front line or Forward Observation Base, drop the flatrack or container and drive straight off, rather than a fixed back truck, which requires several troops to unload the payload by hand. This means the vehicle is a stationary target, as well as there being a greater period of time elapsing from when the truck returns along the route it took, allowing for an enemy to set up an ambush or roadside bomb. Other advantages are that you don’t require another vehicle like a forklift at the FOB to unload a DROPS like you would do with a fixed back truck. The pay load is just left there for the troops to access. Drops drivers don’t have to hang around waiting for their load to be put on their fixed back truck. One DROP’s truck can transport flatrack or containers whilst the depot crews put the loads on spare flatrack or container at the depot whilst the DROP truck is on route, so when it returns it has a flatrack or container already loaded for it and ready to go straight back out, whilst they start loading a spare or the returned flatrack or container. The British Army operate two DROP’s vehicle. The Leyland Medium Mobility Load Carrier aka MMLC, and the Foden Improved Medium Mobility Load Carrier (IMMLC). 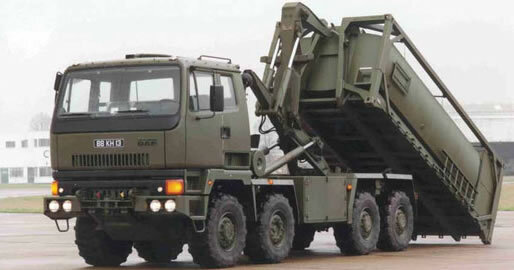 The British Leyland MMLC “DROPS” truck is a 8×6 load carrier with a 15-tonne flatrack payload. Entering service in the 1990’s. a total of some 1400 to 1500 were ordered and can also tow a trailer. The vehicle served in the Gulf War and experienced problems due to the sand. The vehicle went through an upgrade in 2002 and the MoD is replacing the vehicle with a new MAN family of vehicles. Many can be found for sale via NATO surplus vehicle dealers.